Without influence there is no leadership. John Maxwell states, “leadership develops daily, not in a day” Leadership is a process. In the 21 Irrefutable Laws of Leadership, John Maxwell states, “Champions don’t become champions in the ring, they are merely recognized there.” People who aspire to become great leaders, must relate to the boxer. They must progress through the stages with hard work and determination for success. One must however, realize the stages within the process and what each entails. After all, each stage within the process, ultimately allows the leader to influence. 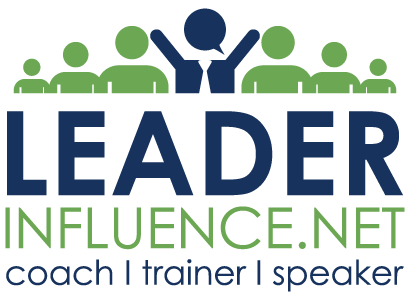 Through my development of leadership training material, speaking on the subject and coaching business professionals, I have concluded that leadership is achieved through a simple five (5) stage process that culminates with influence. Don’t take anyone for granted – Value everyone and every task they perform, regardless of their position. Convince them that you want to make a difference – If you don’t believe in it, how will they? Follow up and follow on – I say it all the time, “Action is Traction”. Look for small and quick things that you can address. Start getting their buy-in by winning in the little things. Look for common ground – I look for things in common. For me it’s baseball, NASCAR. Listen in your conversations and key in on things that you have in common. Be honest and transparent – Honesty and humility go a long way in connecting with people. Leave the arrogance at home. Once you feel a connection, move on – You must complete the connection before moving on to any other stage. Without it, there is no other stage. When you connect with employees, you position yourself to make the most of your efforts, thus creating an environment for performance. Connecting creates the foundation for moving to the next step, building a sincere relationship. In his book, My Personal Best, author John Wooden writes; “There is a choice you have to make in everything you do, so keep in mind that in the end, the choice you make makes you”. Nowhere is this more evident and true than in the relationships you build. Building a sincere relationship is the second stage of the leadership process. Relationships are sacred. When we connect with people, we must maintain that connection by building a relationship. That simply means spending time with employees. Helping them solve problems, standing with them in the rain, snow and heat. Being there to hear their struggles and concerns. Relationships are the key to creating trust. In the relationship stage, employees begin to trust you. In the book, Beyond Talent, Maxwell outlines mutual enjoyment, respect, shared experiences, trust and reciprocity as the five signs of a solid relationship. Steven Covey said, “The relationship neither makes the issue any less real or important, nor eliminates the differences in perspective. But it does eliminate the differences in personality and position and creates a positive cooperative energy focused on thoroughly understanding the issues and resolving them in a mutually beneficial way.” Building relationships creates trust. Steven Covey said, “Trust is the glue of life. It’s the most essential ingredient in effective communication. It’s the foundational principle that upholds all relationships”. Trust is crucial in the leadership process. In fact, trust is the foundation of leadership. Trust can be described simply by comparing it to pocket change. Every good decision puts change in your pocket. Every poor decision takes change out of your pocket. The key is to increase your pocket change, rather than always paying it out. Sure we all make mistakes. And each mistake cost us change from our pocket. However, employees are tolerant of mistake as long as we are transparent, quick to humility and strive to regain their confidence. John Maxwell shares three qualities a leader must exhibit to gain trust; competence, connection and character. Violate anyone of these three qualities and you will loose the trust of those who follow. Trust is doing what’s right because it’s right. I don’t think anyone can remain a leader if he or she continues to make poor decisions and break the trust of employees. In fact, a leader can’t be a leader if there is no trust, because trust leads to influence. If people don’t trust you, you can’t have influence. Without influence, you can’t lead. Adding value is the work of the three stages above. If you have properly connected with your employees and built a sincere firm relationship through trust, then I believe you have the tools and knowledge to add value to them. Zig Ziglar said. “I had to live in the desert before I could understand the full value of grass in a green ditch.” Value is achieved by understanding what is important to those you influence or desire to influence. Let’s make sure we are all on the same page. I am not talking about the monetary value of something, but rather the value gained through effort. You add value through respect. Respect is gained not in the normal things, but rather the difficult right things. One must be viewed as competent and credible before respect is given. John Maxwell said, “While poor leaders demand respect, competent leaders command respect”. As leaders become more and more credible their command for respect become more and more evident. Value takes more than just “telling” , but rather one must demonstrate commitment and consistency in the activities and actions relating to safety. Proactive value should be the basis for all activities and goals and objectives. Proactive professionals are smartly driven individuals looking to read reality and know what’s needed. Professionals who look to manipulate begin a series of distrust which tends to cause relationships to dissolve and the loss of leadership. Albert Einstein said ,”Strive not to be a success, but rather to be of value”. If the organization see’s the value in the direction, activities and actions, then the door to influence is open. Ultimately, the goal is to influence all levels with in the organization in the direction that provides the most successful outcome. Influence is what we need to lead. Without influence no one can achieve anything. Leaders must learn to influence without authority. If you want to lead, you must become a person of influence. 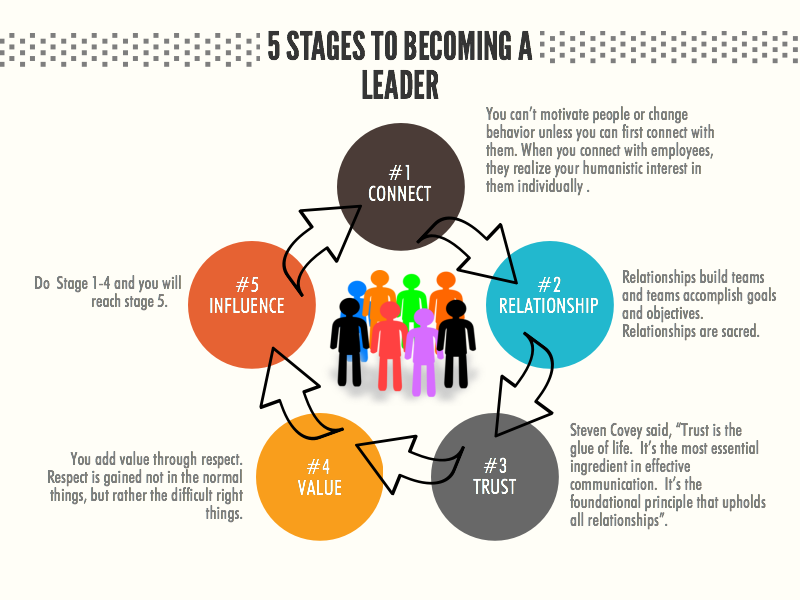 Leadership is achieved by completing these 5 stages. But remember, leadership is influence…………. If you can’t learn how to influence, you can’t be a leader.